Special Forces training is long and hard. There are several phases of training to go through before one becomes a "Green Beret". The training for National Guard Soldiers is the same, just as long, and just as hard as for active duty Soldiers. In fact, it is the same training course. All training in the Special Forces Qualification Course (SFQC) takes place at Fort Bragg, North Carolina except for some specialized medical training. Advanced Special Forces training takes place at Fort Bragg and other locations as well. Prior to starting the Special Forces training 'pipeline' one must have completed Basic Training, Advanced Individual Training (AIT), and Airborne School. There are other requirements as well to include the ability to get a SECRET security clearance and a GT score of 107 or higher. The many different National Guard Special Forces spread across the United States will conduct home-station in-unit evaluations of Soldiers prior to sending them to Fort Bragg, North Carolina for Special Forces Assessment and Selection (SFAS). These evaluations are designed to determine if a Soldier is ready for the intense training ahead of them. View a video about SFRE. This 3-week course prepares Soldiers for the Special Forces Assessment and Selection course. It provides instruction in physical training, land navigation, and other common tasks. "Birth of the Special Operations Preparation Course", Army Strong Stories, May 20, 2010. This course is about three weeks long. You are mentally and physically stressed and evaluated by Special Forces instructors for suitability to continue training in Special Forces. This is the course that assesses and selects Soldiers for attendance at the Special Forces Qualification Course (SFQC). Soldiers are selected based on attributes such as intelligence, trainability, physical fitness, motivation, judgement, and influence. SFAS is both physically, mentally, and emotionally demanding - your body and mind are tested in a variety of situations and circumstances. You are assessed on your tactical skills, physical fitness, ability to cope with stressful events, and leadership abilities. Some of the activities include rucksack marches, team events, land navigation, small unit tactics, obstacle courses, swim tests, and physical fitness tests. Get Selected for Special Forces. A book by LTC Joe Martin - proceeds from the book go to the Special Operations Warrior Foundation. Prepare for Special Forces Assessment and Selection. Videos on the Special Operations Recruiting Battalion (SORB) website that help you get ready. Selected! Be Prepared for the U.S. Army Special Forces Selection & Assessment Course, September 2009. Posted on the Special Operations Recruiting Battalion (SORB) website. Two Weeks in Hell. Discovery Channel video documentary on SFAS. Produced in July 2010. When it was filmed SFAS was two weeks long; shortly before the one-hour program aired on TV SFAS was increased to three weeks. Preparing for SFRE and SFAS. California National SF Guard, A/5/19th SFGA. SF Assessment and Selection Forum. By Professional Soldiers. Special Operations Selection Preparation Forum. By ShadowSpear. Pre-SFAS Workout. California Army National Guard. Special Forces Candidate (18X). A video describing requirements for entry into Special Forces training as an 18X. Phase I: Special Forces Orientation Course. This two-week phase introduces the students to the Special Forces mission, training, career paths, and history. Phase II: Language and Culture. This phase is usually 18-24 weeks long and can be longer based on advanced language requirements. Phase III: SF Individual Training. This phase is 12 weeks long and is comprised of SF CST, land navigation, SERE-C, and other individual skills. Phase IV: SF MOS Training. This is where the Soldier learns his individual Special Forces Military Occupational Specialty (MOS). The training is 14 weeks long for 18A, 18B, 18C, and 18E MOSs and 46 weeks long for 18D (SF Medic). See more info on the SF MOS of 18A, 18B, 18C, 18D, and 18E. Phase V: Special Forces Unconventional Warfare (UW) Culmination Exercise (CULEX Robin Sage) is four weeks long. Phase VI: Graduation consists of outprocessing and the graduation ceremony. Special Forces. By Special Operations Recruiting Battalion. This could be considered the "official" website for Army Special Forces recruiting. It should have the most up to date information for Special Forces selection and training as well as for those interested in entering Special Forces on active duty status; rather than National Guard Special Forces. The Special Forces Qualification Course culminates in a unconventional warfare exercise called "Robin Sage" where students must interact with elements of a resistance group to include a guerrilla band in a rural environment. See "World's Foremost Unconventional Warfare Exercise Turns 35", Special Warfare Magazine, March - April 2009, Volume 22, Issue 2). Army Special Forces Training. By Military.com. Special Forces "Q" Course. California Army National Guard. Language Training. Each Soldier must learn a language as part of the Special Forces Qualification Course. Special Forces Soldiers study a number of different languages. Language training is generally six months long although more difficult languages may be longer. Most language training takes place at Fort Bragg while in the qualification course. The language you will study depends on your unit of assignment. Each Special Forces unit - whether active duty or National Guard - is assigned a regional area of the world to focus on; although all units continually deploy to Iraq and Afghanistan. If you are in a unit that is aligned to PACOM then you are studying a language from the Pacific basin. If you are in a unit aligned with SOUTHCOM then you will be learning Spanish. Other units are aligned with CENTCOM and Arabic will be the language you will learn. Learn more about Special Forces Language Training. Once the Soldier has completed his initial training and he is assigned to a detachment he will take part in language refresher and advanced training. This additional language training can be two weeks to six months long. Locations are likely the home station of the unit although many times Soldiers will go overseas for immersion training in foreign countries. Along with learning the language SF Soldiers also learn a nation's culture, history, geography and other aspects of that society. Some Soldiers who have a special aptitude for languages are afforded the opportunity to attend the Defense Language Institute Foreign Language Center at the Presidio of Monterey in Monterey, California. Special Operations Forces Teletraining System (SOFTS). One method of learning or remaining proficient in a language is taking part in SOFTS. Special Forces candidates are required to attend the SERE Level C course as part of their training. The course teaches the student how to evade capture, survival skills during evasion, survival skills during captivity, methods of resistance in captivity, and of methods of escape. Other topics such as the military code of conduct are taught as well. A detailed look at SERE training can be found on the Special Forces Training web site at the following link - Survival Evasion Resistance Escape SERE training. Click here for a comprehensive listing of Special Forces advanced skills training. Environmental Training. Special Forces Soldiers are trained to operate in waterborne, desert, jungle, mountain and arctic environments usually during detachment level training events. Infiltration Techniques. Special Forces operational detachments may have to infiltrate into denied or enemy-held areas. The SF teams are provided advanced training to accomplish infiltration by air, land or sea. SF Soldiers continue to conduct airborne training throughout their assignment to Special Forces units. 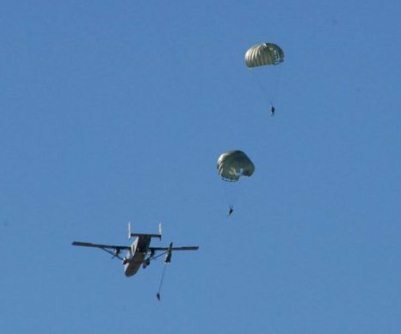 The picture below left shows a static line parachute operation while the picture below right shows a High Altitude Low Opening parachute operation (photos by 20th SFGA). 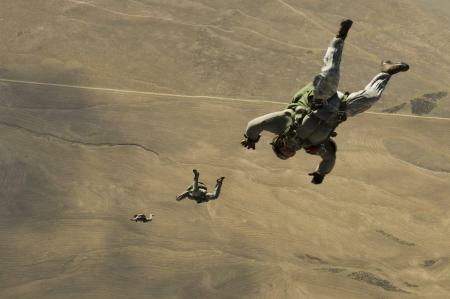 a HALO parachute jump in March 2012. (Photo by Staff Sgt. Stephany Richards of 2nd Combat Camera Squadron). Special Forces Combat Diver School. The Special Forces Combat Diver School is located on Key West, Florida. It is one of the hardest schools offered by the Army. Click here to find out more about the Special Forces Combat Diver Course. There are many skills learned by SF Combat Divers on combat dive teams to include water jumps, helocast, and small boat operations. 18F - Intelligence Sergeant. The fifth enlisted MOS on a Special Forces detachment is the Intelligence Sergeant. This is a senior SF NCO (E7) who has already served a number of years on an ODA. The 18F MOS is awarded after successful completion of the Special Forces Intelligence Sergeant Course at Fort Bragg. 180A - Special Forces Warrant Officer. SF Warrant Officers are combat leaders and staff officers who manage all aspects of Special Forces operations in all operational environments. The SF WO participates in joint, strategic, operational and tactical requirements at all levels of planning and execution of special operations worldwide. The SF WO is responsible for conducting unconventional warfare and the integration of Special Forces tactics and techniques into all operations. In the absence of the detachment commander they assume command of the detachment. They function as the detachment commander of a split-team when the ODA divides to perform multiple missions. To be a SF WO you must be an E-6, hold an SF MOS, and have served on an ODA for at least 3-5 years. Special Forces Warrant Officers do not attend Warrant Officer Candidate School (WOCS) at Fort Rucker, AL as that curriculum is part of the SF Warrant Officer Tactical and Technical Certification Course (WOTTC). WOTTC Course is 20 weeks long and is held twice a year. Joint Special Operations University (JSOU). This school is located at MacDill Air Force Base at USSOCOM and delivers unique SOF educational opportunities through its residence course program. The JSOU mission is to educate Special Operations Forces senior and intermediate leaders (officers and NCOs) in the science and art of Joint Special Operations. Specialized Civilian Schools and Training. Green Berets receive some of their training from specialized civilian schools - especially in the fields of combatives course, combat pistol shooting classes, and security driving schools. Special Forces Training. Go Army.com. United States Army Special Forces Selection and Training. Wikipedia. The SF Pipeline. A forum about Special Forces training on the "Professional Soldiers" website. Ask questions and get answers.